It's compatible with standard USB devices(USB Type-C to USB/Mini USB/Micro USB cable needed). NOT compatible with iPad Pro. "Note": This USB type-c wall charger supports iPhone 8/ 8 Plus / X and provides charging efficiency up to 15W, meaning that can charge 50% in 30 minutes as long as used with an Apple Original USB C TO Lightning Cable. Reversible Connector: This USB Type-C wall charger is a user-friendly reversible connection charger, you would never worry about wrong insertions and achieve amazing charging speed. All-Round Protect: built with industry grade materials and premium circuitry, always protect devices for the safe charging process. No need to worry about damaging your device. Convenient Charging: Foldable plug and extremely compact body for portability wherever you go and the cool-blue LED provides soft lighting when you charging. 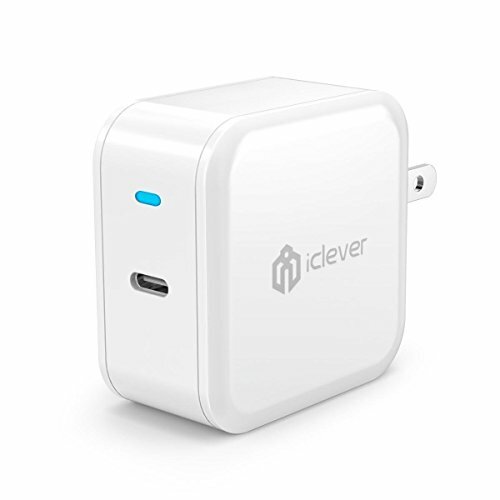 What's You Get: iClever BoostCube USB Type-C Wall Charger, user manual, 30-day money back guarantee, 12 months replacement warranty and lifetime support guarantee.